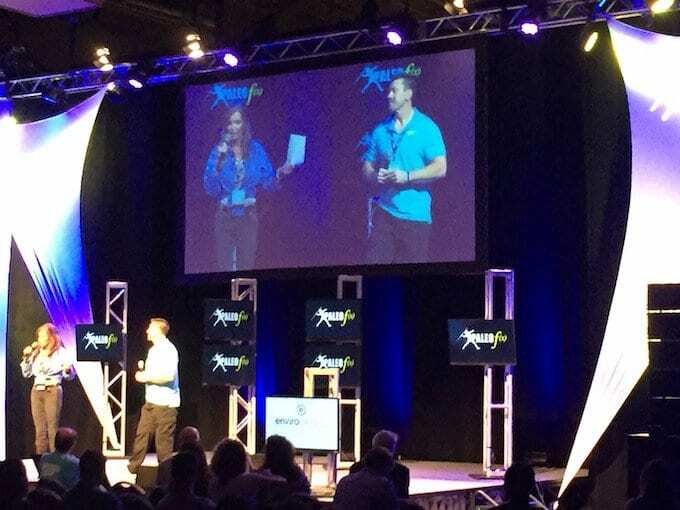 One day, about a couple of months ago, I realized I’d not been to any conference-like events since 2012. I thought I might be done with them. 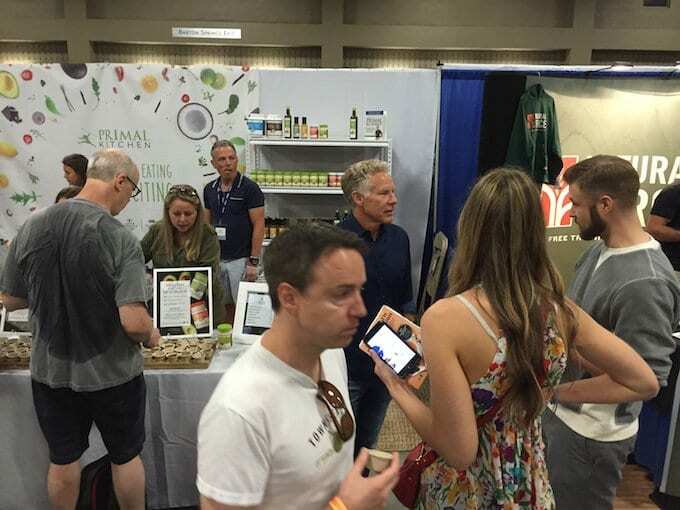 But I decided to check out #PFX16 based on high marks from a couple of people whose judgments I pay attention to. The event is now in its 5th year. So, since Thursday afternoon I’ve been taking it in and enjoying it more than I thought I might. Of course, there are the reunions, always fun. First one? Ran into Jimmy Moore. It was wholly cordial and we parted promising to keep butting heads in the future. Keith and Michelle Norris, Skyler Tanner, John Durant, Chris Kresser, Chris Masterjohn, Mark Sisson, Robb Wolf, Michelle Tam….hope I haven’t missed anyone. Then there are the encounters with strangers, in which, the more common thing I’m told is that I blog like I don’t care what anyone thinks (true), I change my views with more information, and readily admit when I’m wrong and tend to enjoy doing so as it’s a signal of progress. One of a bunch of vendor isles. I initially got into the exhibit hall and my gut reaction was to kind of hate the commercialization. Yea, I’ve got that streak. But, I’ve also got my FitBit operational again (…48,000 steps for 20 miles last weekend, with 10,000 ft accumulated ascent) and so, walking through the isles of the exhibit hall is a great way to rack up my steps. I didn’t sit at all. 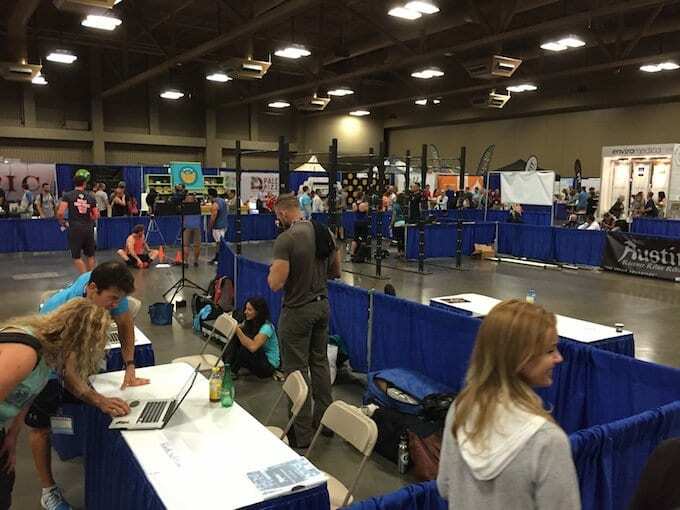 Lots of space for the hands-on fitness oriented exhibitors. So, yes, some of the stuff is ridiculous, and some “food” products I found myself compelled to spit out; but then I thought, what better platform for a budding entrepreneur to get a lot of valuable information, and then the smart ones act on it in whatever way? I’ve collected a number of cards from various products I like, really like, or adore, and will save those specific mentions and promotions for another post. But let me offer some general things. 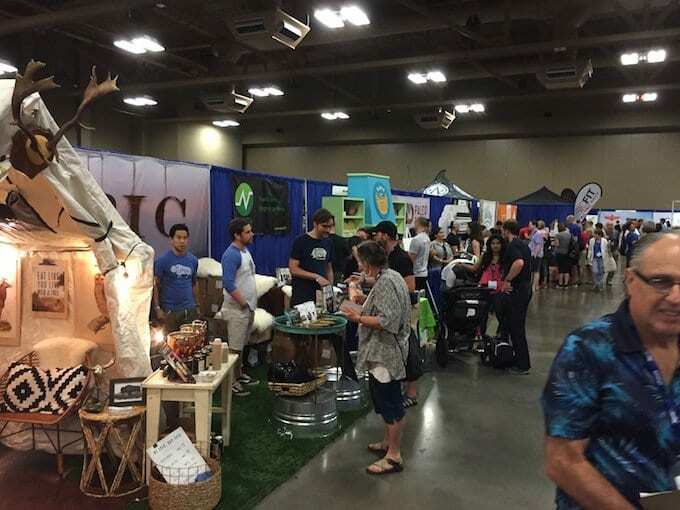 The most promising aspect of this—and if Paleo f(x) and the 3,500 attendees and hundreds of vendors are any indication—is the waning influence of low-carbohydrate and ketogenic dietary angles in the Paleo movement. 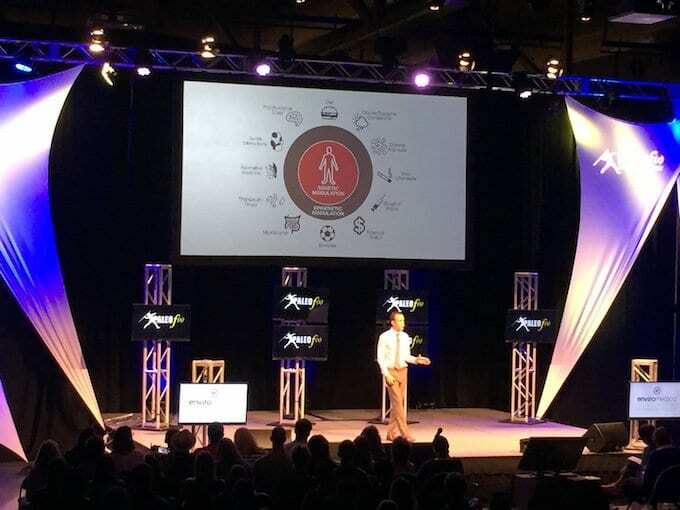 I head carbohydrate conflation (a Coke = a Potato) only a single time, yesterday, during Dr. David Perlmutter’s presentation (which was otherwise very good). Otherwise, few vendor booths even mention carbohydrates at all, few tout LC. There’s a fair amount of carbs on the floor. Finally, the best of yesterday was a gut health panel, and two people really stood out. The first was Michael Ruscio, a functional medicine doc who actually had the courage to contradict another panel member, essentially—in so many words—conveying the idea that all these gut tests are unreliable. Something I personally, and other readers have certainly found to be the case. The second was Chris Kresser, another functional doc, with the winner statement of the day. They were talking about the established efficacy of FODMAP diets for various gut problems, which Chris acknowledges. But, then, in signaling his uncertainty—in contrast to perhaps some others—he says one thing that concerns him is causing a problem down the road. For instance, what if I treat SIBO with a FODMAP diet, but the patient gets cancer ten years down the road for lack of fermentable fiber in the colon. The point is: thinking, uncertainty, and speculation that leads to testable or at least epidemiological study down the road. So, good job on that, Chris. Good to see you back! Whether you like to admit it or not, you are part of the paleo/clean food glitterati. While many people would have recognized Sisson, Moore, Masterjohn etc., very few could say that Sisson, Moore, Masterjohn etc all recognized them! Pity Art DeVany didn’t make it. I have no idea why Art comes up. He has never been to one single event. He was on the original AHS11 tentative. Never saw it through. Long history. Nobody even mentions him. Just a couple of weeks ago I got an email where he thanked me for my Amazon review of his book, four years or more after the fact. Don’t know what to tell you, man. Not very impressive on any level I can think of. That’s OK, but he’s nothing to bring up as though everyone’s missing out. Ah. My mistake. I have confused Art’s earlier paleo conference and the AHS/Paleo(fx) stuff. So what does Jimmy Moore look like these days? Talk about yo-yo weight changes over the years. Sadly, Jimmy is bigger than I have ever seen him. Substantially so. Still, I was nice to the guy and he to me. I hope he figures it out eventually and it’s never too late. Chris Kresser really is a class act. +1. My mother likes him and she hates everyone and everything except ‘jesus’. Martin, I think you can see all sorts of pics if it interests you enough to follow on the various social media where people are putting up pics regularly. 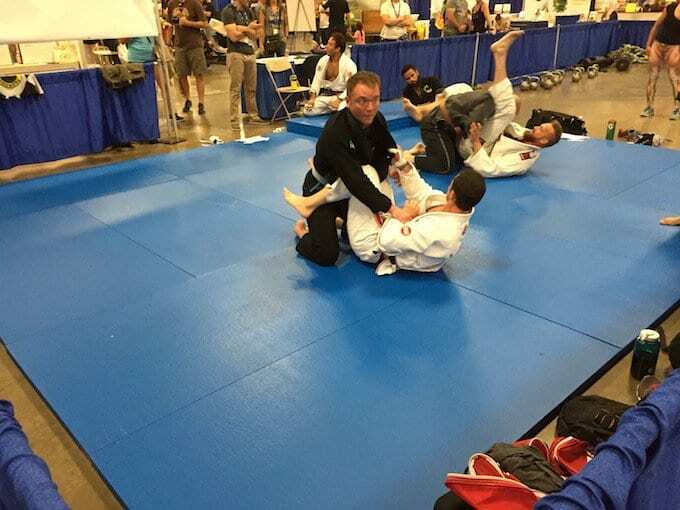 Glad you’re having fun at PFX! I have not had the opportunity to attend one yet, but hope to do so someday. I’ve told Mark Sisson before that he needs to market a line called “Grok Pots”, which consist of a ready made set of ingredients that you buy at the store (or via online delivery) and just plop the contents in a slow cooker and add the water (if needed). I have argued this for a long time. I don’t mind an iced coffee made from hot brewed, especially in latte form or with some cream. This is actually brewed cold. They soak ground coffee in cold water for a long time. Like days. It does not have the depth and complex flavor that hot brewing does and I doubt it extracts all the nutrients coffee purports to have. A big meh to Michael Ruscio. Dude ordered a ton of gut tests for me a couple years ago, seemed thoroughly confused by the results, and Didn’t make an ounce of progress as to what I was seeing him for. Didn’t stop him from taking a TON of my money for tests and supplements before I realized he was making it up as he went along. What do you mean by frozen kits? As in frozen bones? Wouldn’t they have a problem with shipping? I.e. thaw out and go bad in transit? Last time I ate a ‘bar’ was 2004. Atkins. I think these bars encourage abnormal hunger. They are some sort of righteous junkfood. Unless someone is out on a multiday hike or canoe trip or doing something that really requires an energy boost, then, okay because the body needs the energy. But for walking around doing the usual urban stuff? Nah. Better to fast and teach the body to go without food for 12, 15, or even 18 hours. This is the best broth I have ever had, and one kit makes a whole gallon and it’s luscious. I tried to duplicate it twice by using obvious variables they use, i.e., ginger and medjool dates. Couldn’t come close. This stuff is better than coffee. Just had a convo with John Durant in Austin yesterday shortly before I left. He’s backing a bone broth company, haven’t tasted it, but they package in the typical 1-Qt soft containers. My guess is that shipping the frozen bag that makes a gallon is far less expensive than shipping a gallon of water weight. I think one reason you see so much junk food even at a paleo conference is that it’s a hell of a lot easier to start making something like that at home in your kitchen and comply with your state’s cottage food laws and not worry about USDA regulations as you would with something that has meat. From making my own bone broths, I know it’s surprisingly expensive. There’s people who claim that collecting the kitchen detritus and plunking it all into a pot along with bits and pieces of leftover this and that will make fantastic soup. They must not know what really great soup tastes like. A good bone based soup is an art form.